As pet wearables begin to grow in numbers, it's no surprise to see many of them spring up claiming to be a Fitbit for your furry friends. Better known for its pet camera and treat dispenser, Pawbo is trying its hand at a wearable for dogs and cats in the form of the Pawbo iPuppyGo. 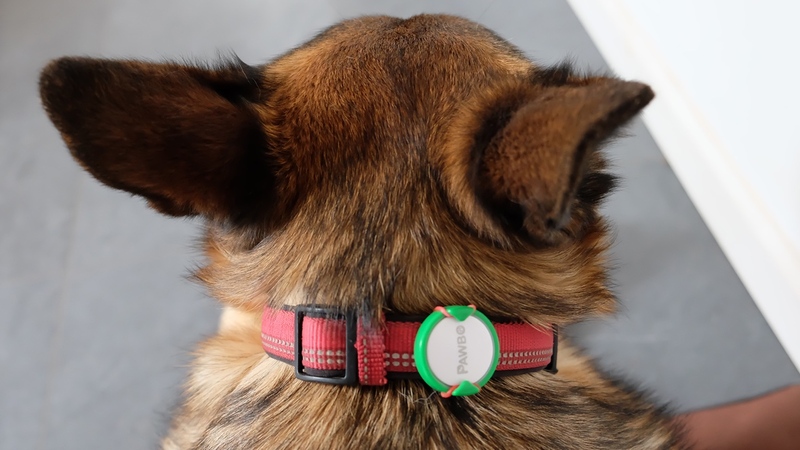 It's a connected device that clips onto your pet's collar and is able to deliver all day activity tracking and will even tell you if your pet is in a good or bad mood. The tracker itself works the same way no matter what collar it's attached to, so why not use it on a cat? This is a particularly small and light unit so it makes this a possibility where others might not so now you can see how far your cat goes when it heads off and just how impressively long it actually sleeps for. Or go out with the dog and enjoy a treasure hunt game using the companion smartphone app. So how does this budget pet wearable fair in the real world? I strapped the iPuppyGo to my cat Bubbs and dog Khaleesi to find out. Right from opening up the box, the iPuppyGo feels worryingly cheap. It's basically bits of plastic on more bits of plastic. Then you unscrew it to place the coin style battery in, and even the connectors are soldered pretty loose and bend easily as you add the battery. Not a reassuring start. That said, it did work fine, complete with a flashing red light to let you know it's powered up. The next step was to download the app. Once again, after opening this up, worry set in. You don't have to be a writer to spot the glaringly obvious spelling mistakes in this app right from the start. It feels like someone has made this for China and run it through Google Translate to get English... without looking at it before sticking it on the shelves. Details like selecting the age for you or your pet when setting up a profile are telling. The use of super small fonts on a scroller looks like it's from the iPhone app but is really badly ported to the Android version – if you have glasses, you're going to need them to set this up. Again, that said, the app works without issues and connects to the tracker first time over Bluetooth. So no real complaints there, beyond eye strain and the overall lack of polish. The tracker attaches to the collar using a stretchy bit of rubber. It's pretty basic but it works well as far as staying put and didn't budge during the time I had it attached to my pet pals. The device itself is super light, hence that cheap plastic feel. While that can be a negative, it's also a positive here for the pet, which won't notice the extra weight on the collar, allowing them to carry on as normal. Although I do question the long term durability should it take a battering in the rain on a regular basis. Thankfully, there were no problems to report at least in my time with it. When it comes to syncing the iPuppyGo, it's pretty simple. Just open the app, tap the refresh icon, and within about ten seconds, the data is updated. Of course this is when updated daily, if you're leaving a sync to once a week, say, it'll take a lot longer because of all the extra data. All in all this worked well, and that was on Android which can sometimes be troublesome when it comes to Bluetooth syncing. Now a step counter when you have four legs isn't going to be quite the same as our bipedal counterparts and as a result numbers can appear high. But since you are getting the step count, that can also reveal other metrics like calories burned and sleep measurements through inactivity. Activity in the app, shown on a chart, is broken down into hours in the day along the bottom with tall bars going up to show steps. There appears to be a tiny number at the top of these bars to show steps but without superhuman vision, or a microscope, they're all but useless. There is also a summary of activity broken down into intense exercise and normal activity with a time read at the top, which is nice for a quick glance at progress. This also has total steps for the day, so you're covered there too. Calories burned is shown in its own prominent section, which is useful to have so clearly placed if you're trying to help your dog lose weight. Another section within the app reads out the pet's mood. Yup, really. This uses some sort of algorithmic magic to detect what the animal is feeling that day, based on its sleep and activity. Presumably more activity and balanced sleep leads to a better mood. To be honest, the dog is excited at meal and walk times and chilled most of the rest. The cats are always nonplussed about everything, all the time. So the mood readout is one to be taken with a pinch of salt. But it is a nice bit of fun to add to the app. The app also offers a location based game, which is aimed at enhancing a walk with the dog. Think a super budget version of Pokémon Go, built into Google Maps. That's what you get – a map screen with your location, and then treasure appears along the way with three levels to collect. The key here is that there are real world prizes to be won in the form of vouchers for things like travel suitcases. The idea here is pretty good, but once again the execution feels a bit amateur hour and like an afterthought added to a map screen. Some people may get into this, but frankly it feels like a bit of a hassle at a time when you're focused on the walk and should probably be enjoying a break from a screen for a few precious minutes. A really nice touch that Pawbo has employed with the iPuppyGo was to use a watch-style coin battery. That means once you've popped it in, you don't need to think about battery life or charging, at all. The battery will keep going for six months. Since the device is effectively always on, that battery life is really impressive. That includes tracking sleep at night and walks in the day. Every time you sync to your phone this will take a chunk of juice as Bluetooth kicks in, but if you keep this to once a day then you should hit that six month life no worries. Even if you don't, the battery won't cost a lot to replace. The Pawbo iPuppyGo is a very basic tracker that covers your movement and sleeping basics across animal breeds and species. But one that does it in a way that feels very budget from the plastic build of the tracker to the poorly finished app. It might make a great intro for those wishing to give pet tracking a try, but it's more likely to be a gateway to a more high-end pet tracker.